Progress School of Motoring have always liked to stay ahead of the game; be it from launching their brand new, modern & responsive website and web management system in 2016, boosting their online marketing presence in partnership with J-D Design through 2017, integrating intensive course booking and payments in early 2018, and now launching their brand new Progress App towards the end of 2018. In order to continue standing out against the competition, it was key for Progress to be able to offer additional support to their students throughout the whole process of learning to drive. With that in mind; we held a meeting to discuss targeting the only aspect Progress hadn't previously become involved with - the Hazard Perception test. Since 2016, Progress have offered DVSA-style theory practice and result tracking via their website - something to this date gets unparalleled use in comparison to their competition both locally and nationally! The app needed to offer real-test-like practice, and for that to be the case; the full set of DVSA-provided practice video clips were purchased and included with the free mobile app. The new app is able to keep track of your previous tests in a similar way to the online theory practice tests offered on the Progress website. Progress now offer "the full package", from offering advice and guidance through the earlier stages of getting your driving license right through to supporting, training and progressing you through the practical test. Progress School of Motoring are the largest independent driving school in North Wales, covering areas from Anglesey to Rhyl, and Blaenau Ffestiniog to Flintshire. 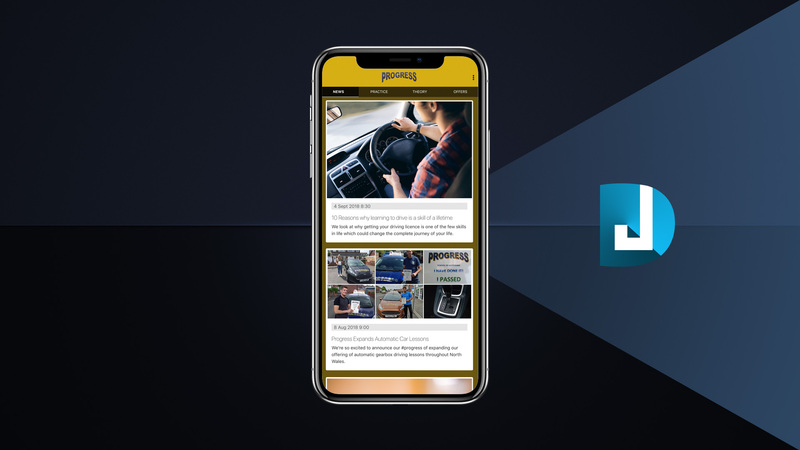 As with any business, it's key to ensure it sees a return on its development investments, and for that reason, we've started turning the Progress mobile app into a fully digestible news feed which pulls in the latest news from their website management system, and also engages with users to sign up to the Progress free theory test practice system. Finally, the Progress team are able to dynamically feed special offers, both long-term and seasonal in order to entice new sign-ups, recommendations and sharing in order to increase their reach in all the areas of North Wales that they cover. Of course, this is the first version of their new app. There are lots of features which can and will be added to the Progress App in the future. The whole team at Progress have always been great at thinking outside of the box, and J-D Design looks forward to working with Progress over the coming months and years to develop more features and updates into their website, management system and mobile apps. If you have suggestions for them or wish to explore getting your driving license in North Wales, visit here. You can download the app today on either the Apple iOS App Store or the Google Play Android Store.